On Wednesday, we spoke about the infrastructural development necessary to bring Puerto Rico back to its feet. We’d like to continue this trend by examining what the legal, regulatory and political restructuring of Puerto Rico will have to look like in order to bring about real growth and change. What will this look like? To call the Puerto Rican legal and governmental systems insufficient would be and understatement at best. Through a strange combination of demographic shifts, regulatory stifling and special interest pressure, Puerto Rico’s governance scores come out as some of the worst in the world. So bad are these metrics, in fact, that countries like Somalia and Haiti surpass them in certain fields. These fields are such that the business environment is made almost artificially unfriendly. 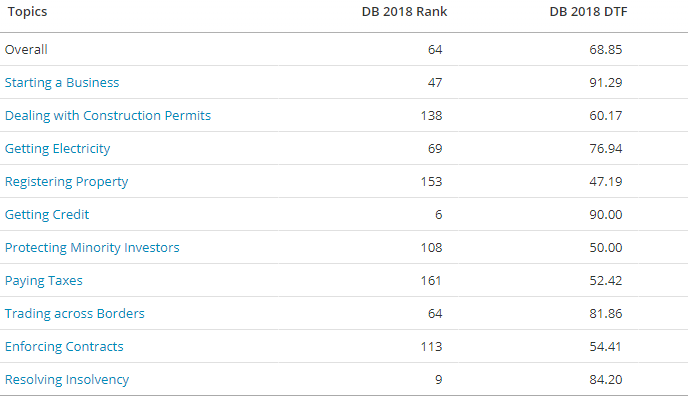 Let’s take a look at the World Bank’s “Doing business” index and see where Puerto Rico lands in the rankings. "Now, that can’t possibly be right. A territory of the U.S. can’t possibly have governance that bad!" Perhaps it can. When a polity is smothered with as much red tape and bureaucracy as Puerto Rico is, opportunities for corruption reveal themselves. The situation Puerto Rico finds itself in leads to a massive brain-drain of quality people to the mainland, as doing business on the island becomes more and more risky for small and medium entrepreneurs. Not only this, but the state-owned enterprises that are supposed to provide the people of Puerto Rico with necessary services are in debts so deep that bankruptcy is the only solution. We’ll examine the debt question another time, but we’ve ascertained that centralized ownership over these firms did little to provide quality service even before Maria. Currently, Puerto Rico houses a foreign trade zone made up of several territorial units spread across the island. It is this zone that is supposed to promote trade and commerce between the U.S. and Puerto Rico, however regulations that are yet to be repealed are stifling such efforts. This zone and ones like it house hundreds of businesses in Puerto Rico, as they have fiscal, tariff and regulatory advantages for doing so. This is well and good, but a mere race to the bottom isn’t enough to provide the people of Puerto Rico with quality governance. A solution we’ve mentioned last week and which we firmly maintain is Puerto Rico’s best bet is the decentralization of all fields: jurisdictions, infrastructure, fiscal and educational. This can occur in any number of ways: Smart cities, seasteads, e-Government, and special zones. How are these new polities to be created, however? We won’t go into the fine details, but there are ways that the government of Puerto Rico can be convinced to allow a greater dose of autonomy to its municipalities (of which there are 78). Once this is achieved, the grounds for startup societies become obvious. Several proposed projects already exist – and more will come once the favorable strategic position of the island becomes apparent to would-be business partners and investors. Current regulations are overly selective and do not apply a broad enough approach to actually attracting innovative entrepreneurs. Tax rebates, credits, and exemptions are well and good to a point but Puerto Rico fails to recognize that its most productive citizens are leaving in favor of greener pastures. Worrying indeed - if present trends continue, it is likely that the age of the average Puerto Rican will become over 40. Once decentralization is implemented and a more attractive living and business environment established, Puerto Rico may begin its slow climb to become the Singapore of the Caribbean. Puerto Rico's legal quagmire is deep: vested interests both public and private are battling against the pressure to decentralize: after all, it is these government service providers that will be put out of a job if they become accountable to competition. How, then, do we make such powers-that-be less relevant in the attempt to rebuild Puerto Rico? It is wise to start locally in these issues. Mayors, local community organizers and similar local leaders must first be convinced to allow for the creation of new infrastructure, business opportunities and similar developments. Only then can the move be made to the legislature and higher echelons of government. Government officials must in either case approve of the creation of startup societies in Puerto Rico - it's their job, after all. How this is to be achieved specifically - we leave to the many governance entrepreneurs that are certain to rise to the call let out by nations worldwide. Puerto Rico suffers from terrible corruption and brain-drain. The way to rectify this is to undo the systemic faults in government that lead to this situation. A method to achieve this is through the localization of governance and implementing e-governance. Puerto Rico can become a caribbean powerhouse, but needs to focus on these changes.